Let's face it, we treat our pets better than we treat ourselves. When you think about it, our pets are not really "pets" at all, they're family members...that are constantly hungry, sniff butts and can't help but stick their noses in everything that smells funky. They make us laugh, they comfort us, they're great listeners, and even if they do something wrong, you just can't stay mad at them. So what if they ripped up your pillow last week, at least they didn't borrow 50 bucks from you and then never called you back. All they truly want is just love, care and LOTS of attention. When it comes to care though, there's no room for shortcuts and cutting corners. We are talking about our furry loved ones after all. Just like our skin, our pets skin absorbs everything you put on it, that's why SofiesSecret carefully "handpicks" each ingredient that goes into SofiesSecret XL Pet Wash Cloths, so you don't have to worry about all those harmful and dangerous harsh chemicals. Natural ingredients like Chamomile, Ginkgo Biloba, Green Tea and Aloe Vera. These key ingredients help heal, nourish and moisturize your pets coat, skin and fur. Furthermore, there are 3 other ingredients that we've added, Cinnamon, Sesame Seed and Lemongrass Oil. These natural oils, when combined correctly, help prevent fleas and ticks from creating apartment complexes on your pet. SofiesSecret Pet Wash Cloths are Extra Large and Thick so that, regardless of how big or small your pet is, you can easily get the job done with just 1 or 2 wipes (unless you have a pet elephant). To make things even better, there are 50 sheets inside each bag encased in an eco-friendly, refillable tub that can be used repeatedly. Moreover, SofiesSecret XL Pet Wash cloths are naturally scented with natural extracts and oils. That means no added perfume and/or fragrance, period. Cruelty Free & Vegan, Sensitive & Hypoallergenic and Odor Eliminating, does it get any better? Coconut Oil Scented, Rinse Free Grooming Wipes that are hypoallergenic, deodorizing and fragrance free. 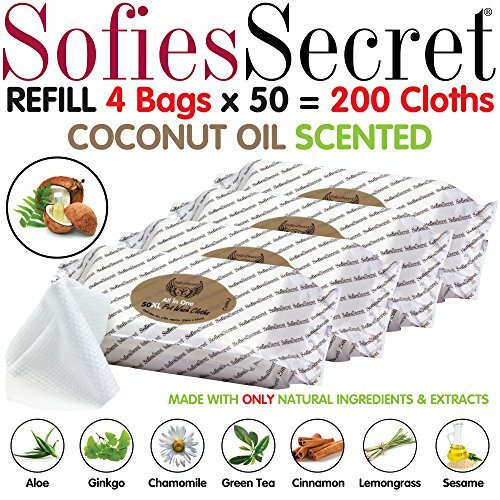 SofiesSecret Pet Bath Wipes are scented with only natural and organic extracts and oils. Use it All Over Your Pet, SofiesSecret Pet Wash Cloths are safe to use on your pets Paws, Coat, Face, Ears, Skin and Teeth. 200 pH Balanced Bath Wipes, infused with natural ingredients and extracts that protect, nourish and soothe your pets paw, face, teeth and sensitive skin / coat. Made with Only Natural Ingredients & Extracts such as Chamomile, Ginkgo Biloba Leaf, Green Tea, Aloe Vera, Cinnamon Oil, Sesame Seed Oil and Lemongrass Oil. Cruelty Free & Vegan, SofiesSecret is PETA approved, Green America and Leaping Bunny certified. SofiesSecret cares about your wellbeing, the environment and our furry loved ones. If you have any questions about this product by SofiesSecret, contact us by completing and submitting the form below. If you are looking for a specif part number, please include it with your message.